If I was to tell you that a government office in the village of Balsamand, located on the margins of Thar Desert in the district of Hisar in Haryana, shares a lot many similarities with Amazon; you would probably doubt validity of my statement. So let’s start our conversation with listing the reasons why does one trust Amazon? Streamlined process, faster processing, transparency and tracking, online payments, grievances handling and feedback and of course active communication from the service provider through emails and SMSes. Now let’s imagine all these elements were replicated in our old dusty government offices, because after all just like Amazon they also deliver something to the citizens: Public Services. That is exactly what Haryana Government did with the aid and advice of Governance consulting firm Samagra. 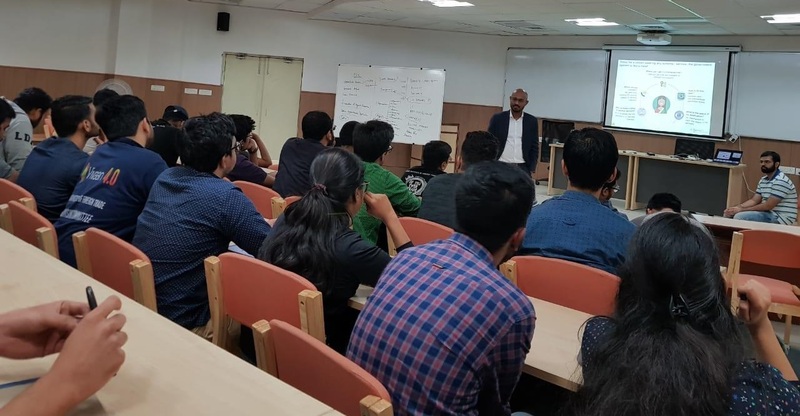 In the last week of February Mr Utkarsh Vijay, manager at Samagra, conducted a workshop on “Strategizing Solution For A Complex Setup & Service Delivery In Government Sector” at Indian Institute of Foreign Trade’s Kolkata campus and discussed with students in detail how Samagra implemented one of the largest citizen service delivery transformation program Antyodaya SARAL in the country. This is a citizen service delivery transformation program where more 500 schemes and services of 37 departments have been brought on a single platform. Here I would attempt to summarise the insights shared by Mr Vijay on this herculean task. 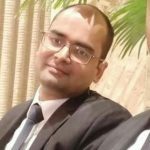 Which services and schemes are available for me? When will the benefits be delivered? Ensuring availability of all schemes and services at Atal Seva Kendra (CSC). Samagra and Government of Haryana envisage to transform citizens’ interaction with into a cashless, paperless and faceless experience. Samagra leveraged a two dimensional implementation plan to put in place the necessary structure: a robust Access Infrastructure and an Institutional Framework. 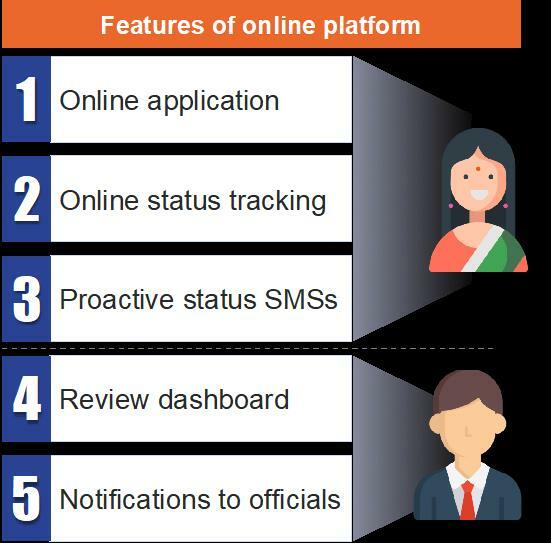 To ensure hassle-free access to the service delivery system for citizens, Antyodaya SARAL focuses on two crucial components: an online platform and streamlined citizen touch points. The online platform was built using the modular Service Plus architecture of National Informatics Centre (NIC), Government of India. The implementation was undertaken by NIC Haryana State Unit without any external vendors to drive cost effectiveness, timely delivery, extensive capacity building, behaviour change through the ownership by departments and long-term sustainability. 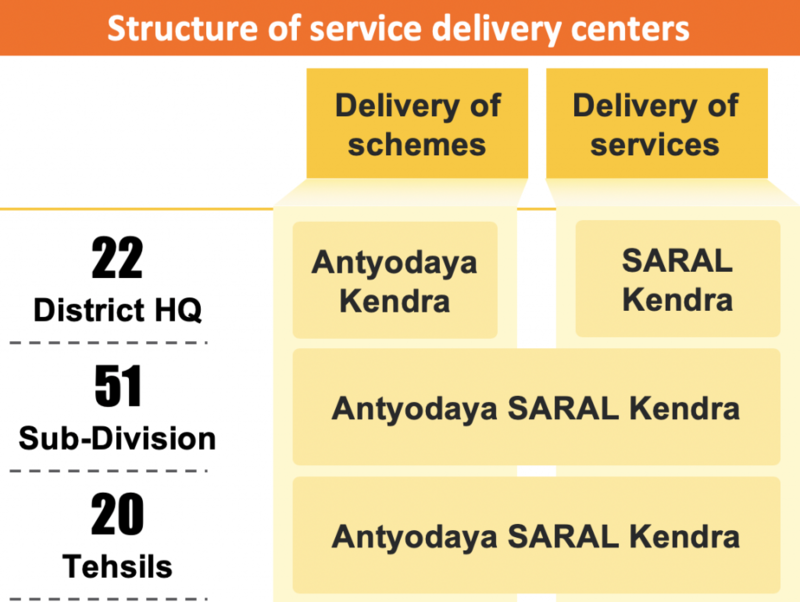 To act as a single point interface for citizens to avail all government schemes and services, 115 state-of-the-art service delivery centers have been envisaged at District Headquarter, Subdivision and Tehsil levels. Right to Service Compliance – A tech-enabled system is being put in place for generating auto appeal on behalf of citizens in case of non-compliance of RTS timelines by officials. This single step is a giant leap towards enforcement of Citizen’s Charter and Right to Service in letter and spirit. Antyodaya SARAL Helpline – A state-wide helpline for service/scheme related queries and grievances for 2.5 crore citizens of Haryana. Since July’2018, more than 40,000 calls have been attended. Knowledge Management Systems –A tech-enabled system for maintaining the information about all the schemes and services has been started. The system is available on the website and all the physical touchpoints. As Utkarsh pointed out you can’t enforce accountability by providing officials with a dashboard. It helps in tracking the magnitude, but it simply doesn’t result in improving the throughput. Accountability flows from data. Samagra apart from conducting daily and weekly reviews with simple info graphics in Hindi also provided competitive dashboards. Everyone, right from the village Kendras to State Secretariat is kept in loop, at lower levels even by leveraging WhatsApp groups. Bottleneck stakeholders are identified and reported immediately. A matrix which is; simple to comprehend, gives higher weightage to under process applications and includes feedback from citizens; is used to evaluate performance. In total 78 parameters are used to judge quality of delivery. 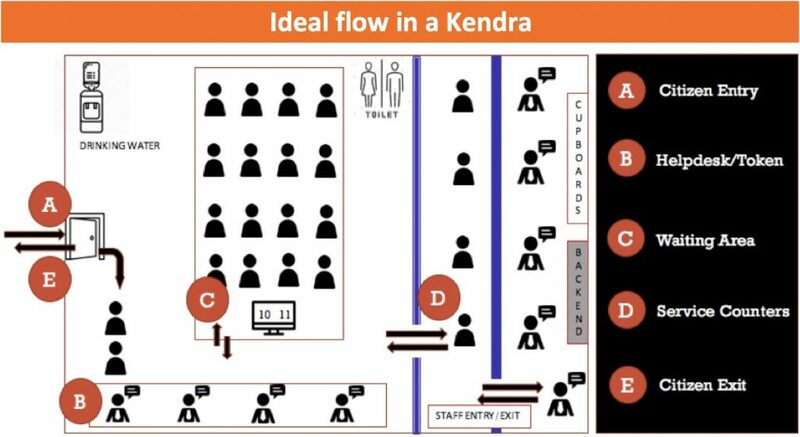 Apart from individual stakeholders a score is assigned to each Kendra also. This success story leads tosome questions which require comprehensive answers. For example the model still leverages the agent driven infrastructure, rightfully so because digital literacy constraint restricts the reach of model. But how do we plan to make eventually it a completely citizen driven process? How can we ensure consistency in face of change in governments, bureaucratic structure and Ministers looking after the departments? Most importantly how do we integrate digital systems across the jurisdictions? For example in our country Customs Department, Port communities and Partner Government Agencies like RBI have their own digital platforms. But they exist in silos and data flow between them is everything but smooth, thus there is a lot of scope for streamlining the foreign trade operations. Similarly federal governance structure of the country mandates a definite development and public services role not only for state but also Union Government and local bodies. Union government has its own digital platforms and some of bigger local bodies like municipal corporations also have their platforms. So avoid compartmentalization and ensure convergence in the development process a great deal of work needs to be done. Apart from these questions it remains to be explained how government plans to leverage the data generated in this process to identify and target the right beneficiary groups for its welfare initiatives.